It’s another cold, wet and miserable night and you could find yourself hit by a wave of first world problems. You have just run out of milk, kitty litter, and coffee. If that wasn’t enough to ruin your evening, you now have an overwhelming urge for a bag of pretzels along with a cold beer while you binge watch your favorite TV show. It’s a familiar urban tale, but imagine there was a virtual convenience store with over 3,000 items to choose from that can be delivered to your door within 30 minutes for a $1.95 delivery fee and available 24 hours a day. Welcome to goPuff, the brainchild of co-founders Yakir Gola and Rafael Ilishayev. Essentially, goPuff is an on-demand delivery service. A convenience store on wheels that is becoming incredibly popular with Millennials and college students. The service is now operating across 15 major US cities including Philadelphia, Boston, Washington DC, Austin, New York, Denver, Chicago, and Seattle. The startup is continuing to grow at a rapid pace and will probably be heading to a town near you soon as the demand for this new way of picking up essential snacks and supplies increases. 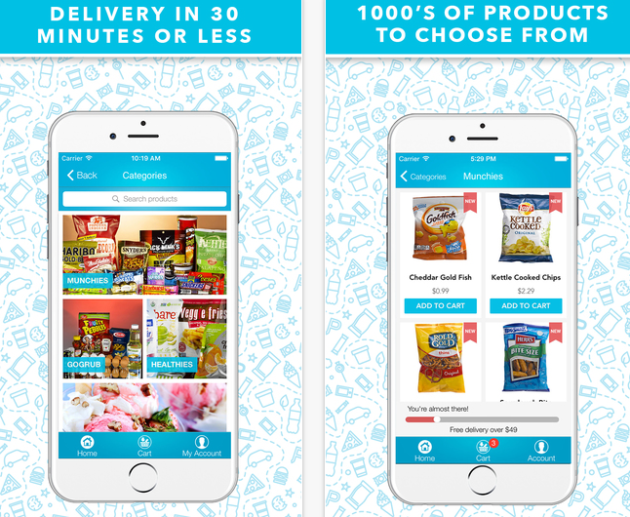 For a $1.95 delivery fee, users can order convenience store items through a smartphone app, and goPuff promises to deliver within 30 minutes or less. It’s easy to see why the service is such a big hit when it makes smashes Amazon and Instacart’s 2-hour delivery, with no additional surcharges or surge pricing. The service is only three years old and is continuing to scale nationally with an impressive expansion rate. While there is an abundance of takeaway food delivery services, goPuff has been innovative enough to have found a niche in the on-demand delivery space. Going head to head with some pretty stiff competition was a very bold move, but it paid off and appeared to have caught the old guard napping. The simple concept of consistently delivering orders not only faster than its major competitors but also for a fraction of the price is also delivering success to the startup. It seems that saying goodbye to the convenience store and hello to getting those late night snacks and drinks delivered within 30 minutes is proving to be a hit for obvious reasons. In an age of instant gratification and the Uberization’ of everything, many will be kicking themselves for not thinking about this idea first. As consumers, we can now hail a cab, book a restaurant table and a hotel within a few swipes on our smartphone. These are our expectation levels for everything. GoPuff has now provided a convenience store, smoke shop, and mini-mart at your fingertips too. The only question that remains is what will happen to businesses that fail to meet these new consumer demands? On my podcast, I chat with goPuff co-founders Rafael Ilishayev and Yakir Gola to discuss further how they’re taking on industry giants and share their inspirational story of success.